Finally, the brick wall hiding Paul Metz came (mostly) down. I decided to focus my next search on Elwood. The first name is unusual enough that I thought I had a better chance of finding him than his father Paul Metz/Joseph Raymond. But I also worried that Paul might have changed Elwood’s name to avoid being found. Fortunately, Paul Metz was not that devious. After much searching, I found an obituary for an Elwood Raymond who died at age 82 on June 26, 1980, in Florida.2 Why did I think this might be the right person? Well, not only did the age match up (my Elwood was born in 1898), this Elwood had come to Florida 65 years earlier from his “native New York City,” meaning he was born in New York, just as my Elwood had been. And Paul Metz had once used the alias Joseph Raymond. George Raymond! So Paul Metz had gone from Joseph Raymond to George Raymond! Did he select the name George in some way to connect to the son he had abandoned as an infant, Conrad’s father George? Was it just coincidence that the man who next partnered with Gertrude was also named George—George W. Keller? It all seemed just a bit strange. 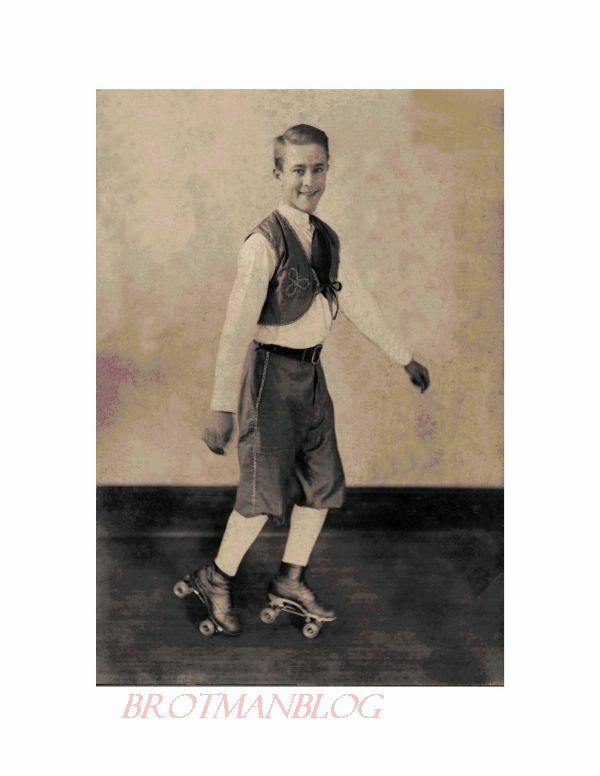 In 1920, Elwood was lodging with two other men in Ocala, working as a skater at the fire station. I am not sure what that means, but the other two men were also working at the fire station, one as an electrician and one as a laborer. So Elwood was now the chief of the fire department (not just a skater!). 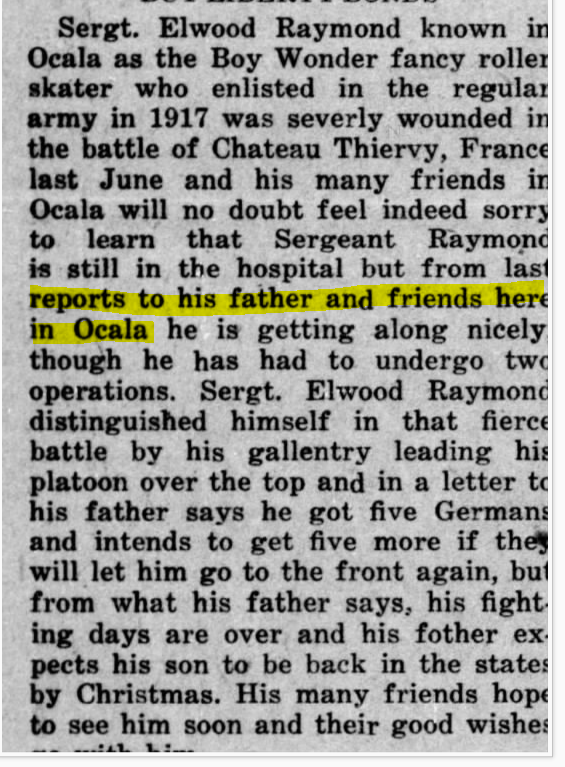 And his father George Raymond was staying with him in Ocala and making it his headquarters while traveling—for work? What kind of work? 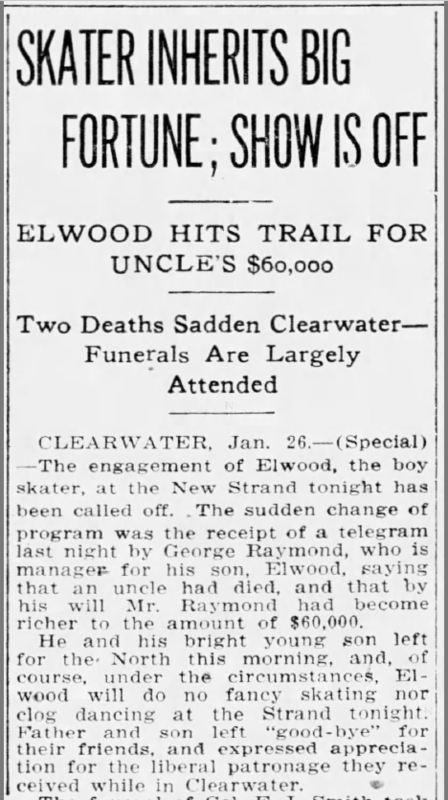 The wedding announcement is also interesting in that it describes Elwood as “the only son of Mr. George Raymond.” It would thus appear that at least as of 1922, Elwood was unaware of his brother George B. Metz. 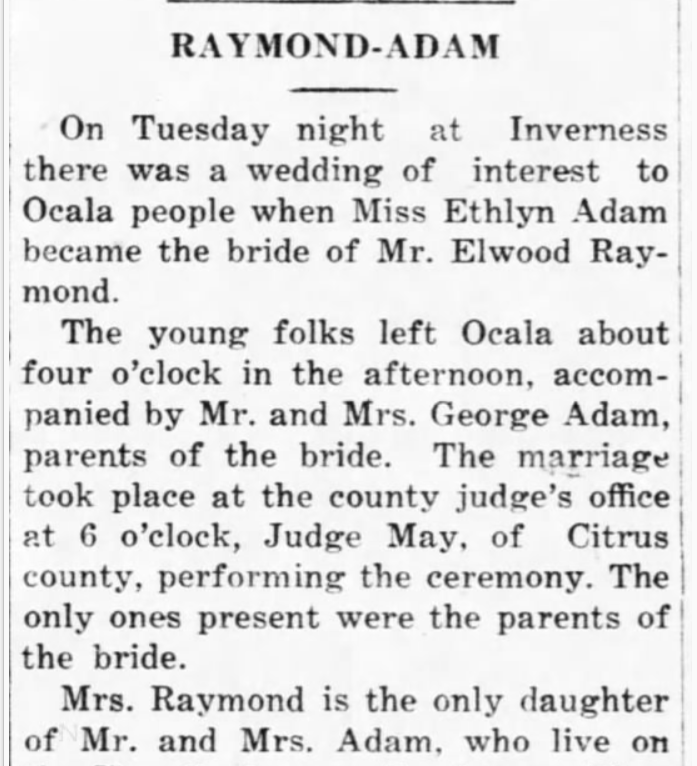 On September 4, 1922, the Ocala Evening Star reported that Ethelyn and Elwood had a new baby, a son.5 Two years later they had a daughter. In 1930 Elwood, Ethelyn, and their two children were living in Oneco, Florida, where Elwood was employed as a letter carrier for the US Post Office. Ethelyn’s mother Rosa was also living with them and operating a fruit farm. 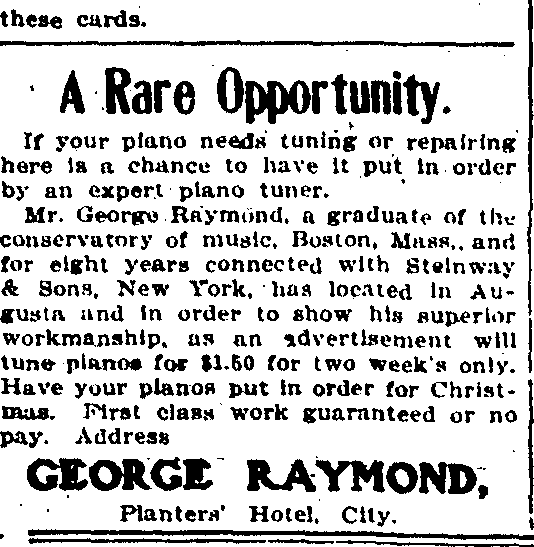 So in 1905 George was still a piano tuner and possibly still conning—a graduate of a Boston conservatory? Eight years with Steinway & Sons in New York? I’ve seen no evidence of that, but I suppose it is possible. It looks like George and Elwood had been heading south and eventually ended up in Florida. Who is this “uncle” who left George Raymond (or is it Elwood Raymond) a fortune? None of George’s known uncles or Elwood’s known uncles died in 1915; Bernhard Metz died in 1914, however. Was Paul/George somehow trying to claim a share of the estate? Or was this just an excuse to get out of the Clearwater performance? Aside from the mentions in the news clippings above, I have no other information about Paul Metz/George Raymond’s whereabouts, his job, his life. He was living in Georgia in 1905 and in Florida at least from 1915 until 1922, given the newspaper articles. But before or after? I don’t know. I found no other trace of him as Paul Metz or Joseph Raymond or George Raymond. If he used another name, I have no idea what that might have been. And I have no idea why he had kidnapped his son Elwood and abandoned his wife and newborn son George in 1900. 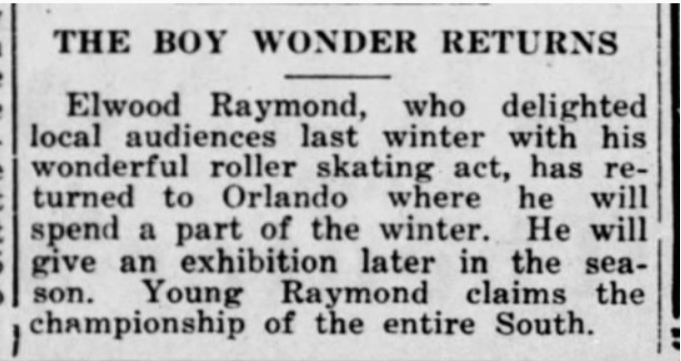 The obituary states that George Raymond had been living in Manatee County, Florida, for six years, and had previously been in Philadelphia. My guess is that the reporter confused the birth place with his prior residence. I found no evidence that Paul/George had returned to Philadelphia in the 1920s. 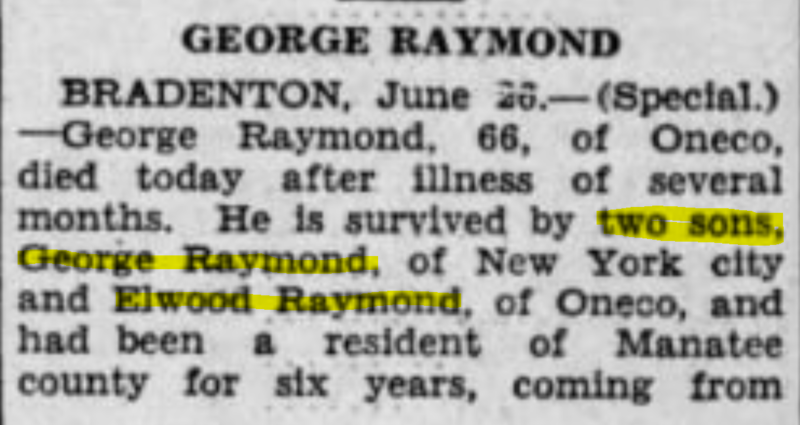 More importantly, the obituary reveals that by the time Paul Metz/George Raymond died in 1934, he had either revealed to Elwood that he had another son, or Elwood had discovered it on his own. 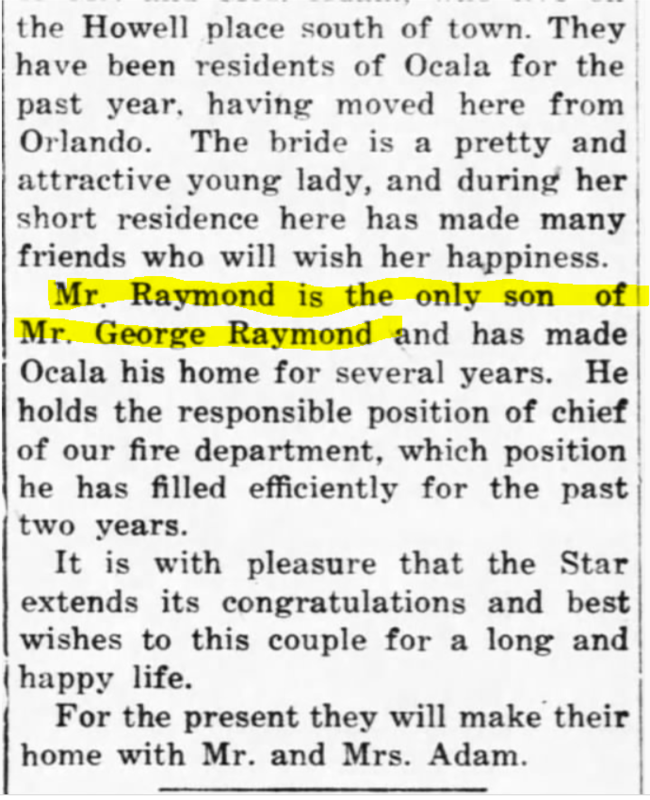 Interestingly, the obituary refers to this son as “George Raymond,” as if he were his father’s namesake. And as if they had an actual relationship. Conrad also learned from a cousin that Paul Metz/George Raymond died in the state hospital in Chattahoochee, Florida, in Gadsden County; this is consistent with the listing in the Florida Death Index. The cousin also told him that George Raymond (Paul Metz) had been in the state hospital for several years for psychiatric treatment and for drug and alcohol abuse. That seems credible, given Paul’s earlier history as an opium user and his long history of lying and stealing. Thus, together Conrad and I had pieced together the long and twisting path of his grandfather’s life, the man who was born Paul Metz and died as George Raymond. There are still gaps in the story, but at least we know the beginning, a bigger part of the middle, and the end. It was one wild roller coaster ride, and I never could have done it without Conrad’s collaboration. 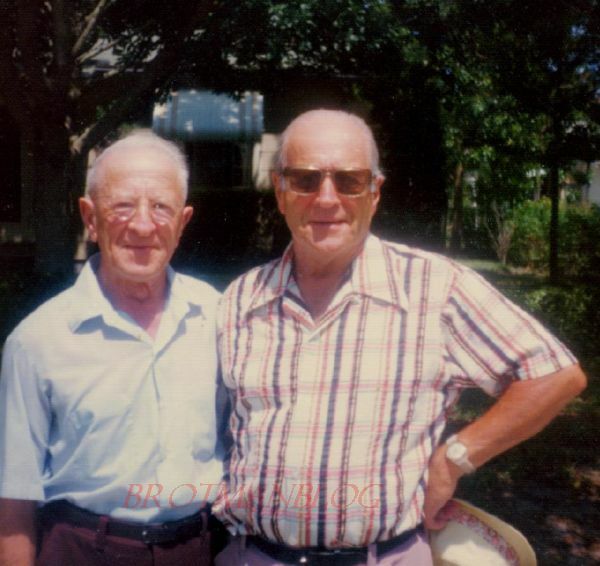 This entry was posted in Florida, Genealogy, Goldschmidt/Goldsmith and tagged Elwood Raymond, Florida, Goldschmidt, Goldsmith, Metz, Paul Metz by Amy. Bookmark the permalink. Congratulations on tumbling this brick wall with the help of your cousin Conrad. You always do such good research but I’m sure you would have been stumped without his input. I know I would have been. It also makes me wonder about my most frustrating brick wall and if the surname may be the problem. Two heads are definitely better than one, especially when one has the family lore. Good luck with yours—it sure doesn’t help when people change their names! It was just a thought. Your finding Paul/George with a different surname makes me wonder about my 2nd great-grandfather. Who were his parents and did they use the same surname? It certainly opens a can of worms once we start thinking that way, doesn’t it? If it was that easy to assume a different surname, how would we find anyone!? Paul followed a pattern of the same behaviors no matter where he lived. He had to have been a good Dad, though, to Elwood. He grew up to be responsible as shown by how well he did at the Fire Department and when he was younger he had to adhere to what I think was quite a demanding schedule between practicing and performing for his skating appeareances. It’s hard to know both how Elwood was raised or how happy and well-balanced he really was. What stories had his father told him about the family left behind? Did he ever meet his mother? He must have thought she died or deserted him. I am certain there were scars. We only know a tiny part of his story, that which was in the newspapers. What you say is true. I know I’m responding to what was in the newspapers. Still it was positive and his actions and the way other people viewed him and his wife give me a good impression. People can go through many difficulties and suffer much and they can still develop strong character and not let their personal sadness hold them back in other spheres of life. Absolutely true—some people are just wired in a way to be survivors whereas others who have so much end up troubled and miserable. We are a strange species, aren’t we!? I have a similar story where an ancestor changed his surname from McNulty to Raymond (must have been a popular surname at the time!!). Only I haven’t been able to find 100% proof it’s him. He was still with his family and death certs for the children list them as Raymond. And to make it more complicated, his wife’s sister (who is a direct ancestor) did run away with her infant child, leaving the older three behind, only to re-marry later claiming she was never married and has no children. I’m still trying to find out what happened to her after, but her youngest was brought up by the grandparents in Boston, and in his will the father states 15 years later he is unaware of the whereabouts of his wife and/or his child whose name he doesn’t know. Some of those stories are hard to research! Wow, so many parallels and similarities. It does make me wonder how common these things were—people changing their names, kidnapping children and abandoning others. So sad. What do you mean it wouldn’t let you post a separate comment? For some reason I couldn’t see the comment box, could only click on reply to previous comments. OK, let me know if it happens again. Thanks, Lana! I am so glad Elwood had a good life. I was worried he would be tricked into a life of drugs and crime. This is actually a happy ending. Yes, in many ways it is. But I am sure that both Elwood and George paid a price for their father’s misdeeds. Yes I am sure. But I am glad they finally met. Thanks, Sharon. I also have so many questions, but I don’t think we will ever know more unfortunately. I am so glad that you were to piece together with Conrad’s help the mysterious life of Paul Metz/George Raymond. Great detective work, Amy! Once again your persistence paid off. Thank you, Peter, and thanks for reading and following along! This is amazing detective work, but I was surprised to hear that only after you unraveled the whole thing did Conrad tell you that his father and uncle had been in contact and that he had a picture. To be honest, I’d be livid. I have collaborated with newfound relatives and I expect them to be as forthcoming as they can. I was a bit surprised myself. I don’t know why he held back that information. I didn’t question him about it. The subject is obviously a sensitive one for him, and I was just grateful that he shared what he knew. After all, this was his grandfather and his father, not some distant long ago fifth cousin. 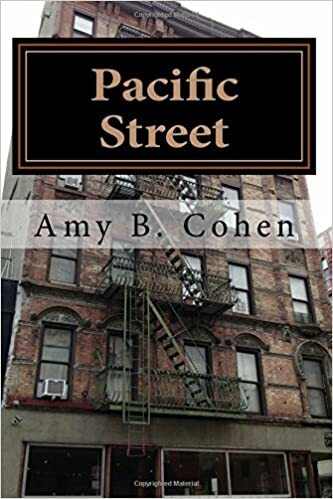 Hi Amy, a fabulous and admirable account of the issues the family faced in their lives. I want it to continue! Thank goodness Conrad was able to help. A poignant photo of Elwood and George. Every picture tells a story. It sure does. Thanks so much, Shirley! Another terrific story Amy! It has some parallels to my great grandfather Sally Bernheim/Charles Blume. He was also a con man, but he left his kids with their mothers. Thank you, Mary—it’s amazing that these things happened in so many families. Meant to add that he called himself a professor and tuned pianos too. One you are a liar, your lies can get bigger and bigger. Fascinating! So many times I have found newspaper clippings that pull together mini-mysteries for folks in my family tree. You really pulled the story together well! Thank you! Glad you found it interesting. What a story! I’m so glad that Elwood and George reconnected later in life – and what a great photo of the two of them together. What a great absorbing mystery – I’ve caught up with posts after having a busy few weeks. It was so nice to see the two brothers together and how families are never straightforward!! Great bit of research by you both. Thanks, Alex—glad you were able to catch up and enjoy this one! I hope all is well! Yes thanks. Just been a bit busy with holiday and work. Also got a new cat at the weekend – my lovely boy Sam had to be put to sleep back in June. We picked up a rescue cat – a lovely 1 year old black shorthair. He is called Moss and is adorable! I am so sorry about Sam. You know I am a crazy cat lady, right? We have three—Smokey, Zoe and Chloe. Moss sounds wonderful! And good for you getting a rescue cat. Most of our cats over the years have been rescues, including Zoe and Chloe. Smokey came from an ad in the paper. Thank you! You are right—he IS adorable!